If you think that clouds are best seen during daytime, think again. Actually, there is one type of cloud phenomenon that is best seen during twilight hours and it is called noctilucent clouds. This cloud formation has earned high collecting points among cloud enthusiasts. Check out interesting facts and features of noctilucent clouds. Noctilucent clouds refer to the silvery-blue and wavy cloud commonly sees in the Northern and Southern Hemispheres. It is called night cloud because it literally shines at night. This cloud develops at the mesosphere, the atmospheric layer next to the stratosphere. Noctilucent clouds used to be rare cloud formations but frequent sightings have been reported recently. Their frequent appearances in brighter hues have significantly puzzled scientists. Furthermore, noctilucent clouds have become visible even at lower altitudes and even during daytime. Scientists link the dramatic changes and frequent occurrences of noctilucent clouds to climate change. At What Height is Noctilucent Cloud Found? Noctilucent cloud is a polar mesospheric cloud which is found about 50 miles or 80km above the ground that is 10 times higher than where the cirrus weather cloud is usually found. These clouds are made up of tiny ice crystals with diameters as small as 100 nanometers. While weather clouds form from water particles, noctilucent clouds form from dust particles and water vapor. They come into being when temperatures in the mesosphere fall below -200 degrees Fahrenheit or -130 degrees Celsius, thus, inducing water droplets to freeze into ice clouds. Their frequent occurrences suggest that mesosphere has become more humid and colder due to the greenhouse gases released into the atmosphere. What do Noctilucent Clouds Look Like? Because they are found at greater heights, these clouds appear as thin and rolling clouds in neutral or silvery-blue color, thereby giving a beautiful sight when the sun is below the horizon. Its silvery-blue characteristic is due to ozone absorption when illuminated by sunlight. Sometimes, noctilucent clouds appear in green and red colors and distinctive patterns of whirls and streaks. Noctilucent clouds are classified according to their cirriform pattern. Type 1 Noctilucent cloud takes the form of flimsy cirrus cloud. Type 2 Noctilucent cloud appears as long parallel bands either with diffused and distorted edges (Type 2A) or sharply-defined edges (Type 2B). Type 3 Noctilucent cloud has billows with roughly matching short streaks; either with short, narrow, straight streaks (Type 3A) or wave-like streaks (Type 3B). Type 4 Noctilucent cloud has whirls with a dark center, either with a small curvature that resembles light waves in the surface of water (Type 4A); clear-cut arc with several bands (Type 4B); or whirls with large-scale ring pattern (Type 4C). How common are Noctilucent Clouds? These clouds are common sightings in the evening sky during summertime in the polar region. This is because the upper atmosphere during summer gets oddly cold. 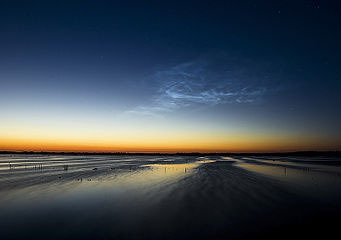 In the Northern Hemisphere, noctilucent clouds occur from May to August, and November to February in the Southern Hemisphere where they are seen during sunrise and sunset. If you happen to live or travel in countries situated in high latitudes and want to spice up your night, check the sky for any noctilucent clouds.